Left the Bordeaux region in France today after 3 wonderful days, learning about wine, meat, cheese and most of all TRADITION. I had a cheese tour of France at the wonderful fromagiere of Pierre Rollet Gerrard, tasting over 15 cheeses in a couple of hours. And there was a story behind all of them - some aged, some fresh, some from spring pastures, some not, some hard, some soft……. And many from recipes that have been handed down over hundreds of years – so why do they come in particular shapes, why are some made in such heavy rolls (some 30-50kg) and why is a cheese made with a layer of charcoal through the middle of it, why, why, why??? TRADITION! 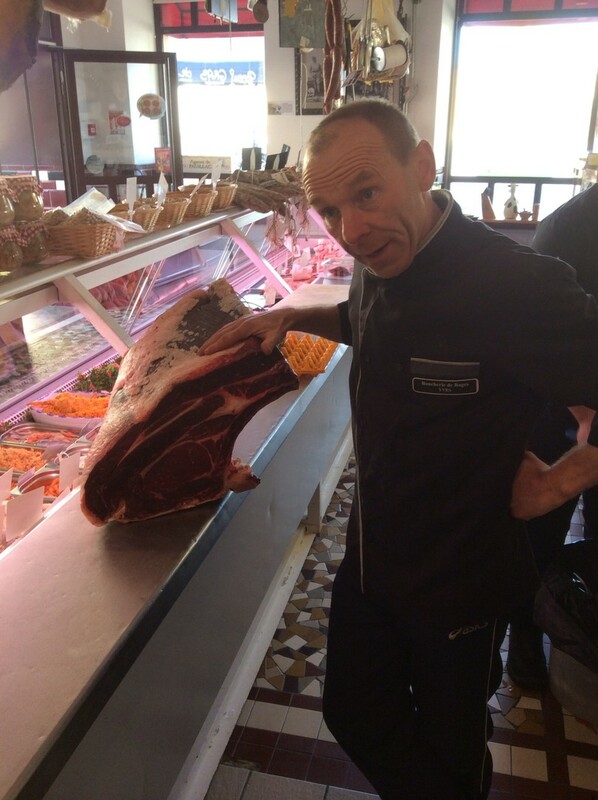 In Bages in the Medoc region, just north of Bordeaux, I met a wonderfully enthusiastic butcher, Yves Bruno, who sells meat to many areas of southern France. He specialises in the lambs from Pauillac and beef of Bazas. This beef comes from steers that maybe 3 to 4yo, with the ribeye section up to 25kg alone. One 5cm wide steak weighs 4kg – so why do they have such big carcasses and pieces of steak – TRADITION! And Bordeaux is obviously famous for its red wine. It produces vast quantities, and amazing quality (in the right years). And the marketing of these wines is done by Merchants - as they have done for hundreds of years. So the few Chateau representatives I met don’t know where the majority of their wine goes, or who consumes it. The producers seem to have very little control over their supply chain, but they are comfortable with that. Why? TRADITION! But it doesn’t end there. In a lovely typically French restaurant in St Emillion, they serve as one of five options for the main course a sausage that is a local speciality, made of pork intestines. Why? From personal experience it is definitely not the taste - must be TRADITION! But it is the respect they have for their produce and the traditions behind it, that I admire in the people. They care deeply for their food and where and how it is produced and prepared. They are not being pretentious when they look at the colour and smell the wine before drinking – that is just part of appreciating a fine product. And this respect is passed onto younger generations – last night at a restaurant I observed 3 young families dining, where the children were given the chance to smell the wine to appreciate the aroma. It is this appreciation and understanding that Gippsland Food Adventures wants to foster and encourage for all the wonderful produce Gippsland has to offer. For the time being, au revoir.